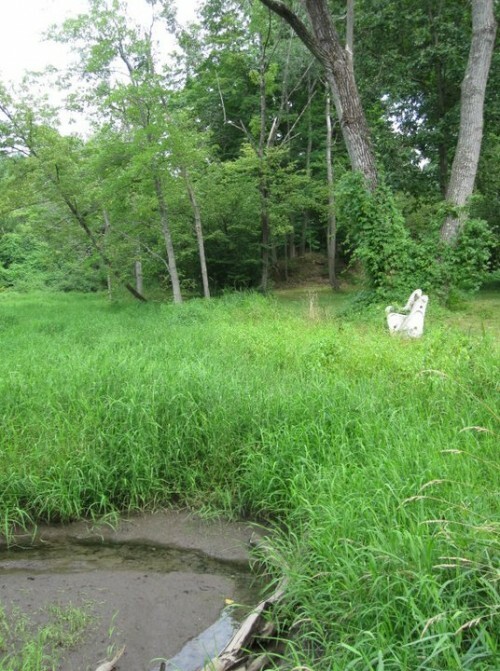 This blog has quite thoroughly documented Vassar College’s relationship with the Casperkill Watershed, mostly because of Vassar Lake and Sunset Lake which are part of it. But there is a little known part of the college campus that is also part of the watershed: the skating pond. Off the beaten track of campus, the Skating Pond lies in the northeastern section of campus, past Kenyon and before faculty housing and nestled by the Manchester Road entrance by Route 55. Though it has fallen into disuse and hardly looks like a body of water now, it was at one time a third option for Vassar students looking to have some wintery fun. The skating pond today, covered almost entirely by Sagittaria, an adaptable, hardy plant species. The water in the skating pond is diverted from the Casperkill. Since its creation, the pond has spent most of its life in disuse. It was proposed by Louis P. Gillepsie, who was the general manager and purchasing agent for the College. In 1923, the College bought 117 acres of land, originally the Wing Farm, which eventually would contain Kenyon and Blodgett Halls, the golf course, Palmer House, faculty housing, and Wimpfheimer Nursery School. Gillepsie’s vision for part of the land was a body of water even larger than Sunset Lake. Then President Henry MacCracken built on the proposal, suggesting that the low-laying land by the “brook,” presumably the Casperkill Creek, be flooded. Where the Casperkill and the Skating Pond intersect. Water is diverted from the Casperkill here; the metal dam seen replaced the concrete one when it was restored in the 1990’s. It is now rusted and fairly ineffective. 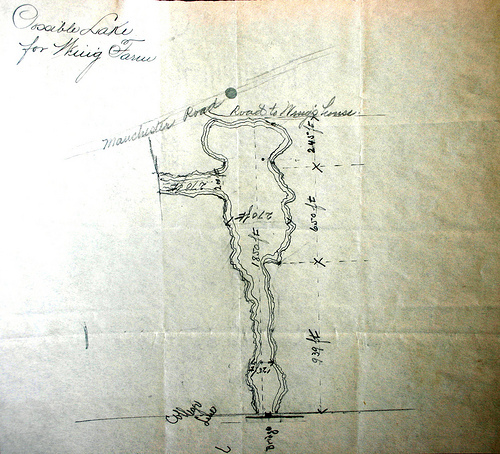 Two years later, Mr. M. Sugar, who worked in the office of the superintendent, created a rough sketch of what the proposed lake would look like. Later, after Kenyon Hall was built (the school’s much needed up-to-date gymnasium), paths were constructed to connect the physical activity areas to Kenyon, such as the golf course, the sports fields, and the skating pond. M. Sugar’s sketch of the skating pond. He originally envisioned a lake 1,850 feet long from north to south and 270 feet at its widest point. When the skating pond was built, it was about a fifth of the intended size. 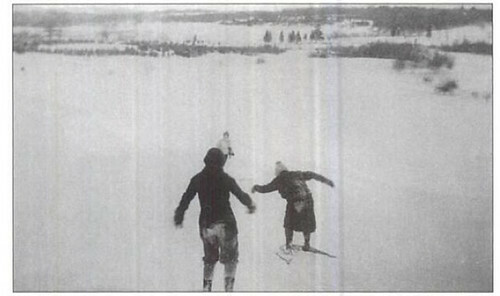 The pond was used for about ten years–Sally and Joslyn Magowan, ’37, a pair of twins who would be associated with professional figure skating, used the pond for practice–before it fell into disuse. It remained in that state for fifty years, until it became part President Frances Daly Fergusson’s revitilization plan for Vassar’s buildings and grounds in the 1990’s. Along with the Skinner boardwalk and the Vassar Lake trail, the skating pond was targeted for reclamation and restoration. One of the benches installed by Jeff Horst and Buildings and Grounds. 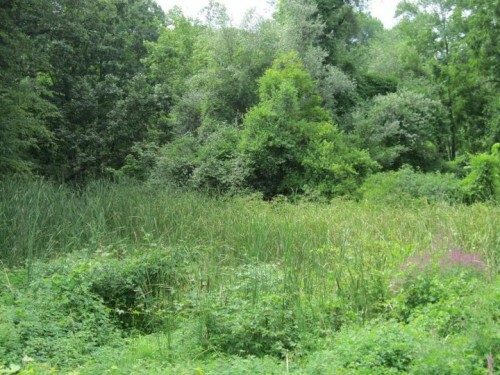 Jeff Horst, the Buildings and Grounds director at the time, along with a four person crew, spent two full weeks pulling out invasive species like honeysuckle and purple loosestrife that had dominated the pond. The also replaced the concrete dam with a metal one, in addition to installing three benches along the pond’s shores. They also restored its original purpose, and created a system in which a red flag would fly if the pond was not frozen enough for skating, and a green flag would fly if it was skate-able. Student, faculty, and the public were all welcome to use the pond, but it never became popular with students, and was mainly used by faculty families. After a few seasons, the pond again fell into disuse. The skating pond from Manchester Road. No longer regularly tended by Buildings and Grounds, purple loosestrife has returned to the pond. 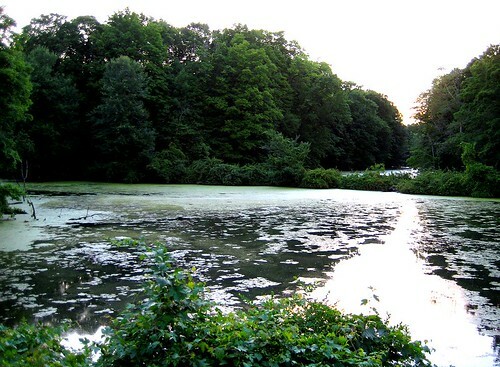 This post was adapted from the entry “The ‘Skating Pond'” on the Vassar Encyclopedia, found here. 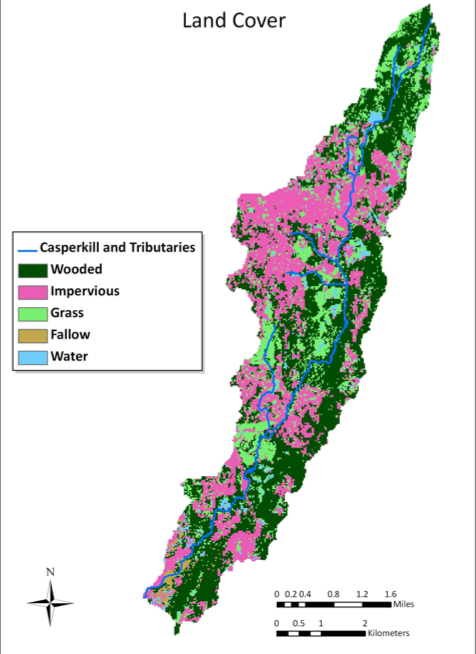 One of the many reasons the Casperkill Watershed is so special is its diversity in land cover and use. The Watershed is made up of wooded, impervious, grass, fallow, and water land cover; and land use ranges from commercial to urban to farm to suburb to rural to the Vassar college campus. This diversity makes the Casperkill Watershed an excellent setting to study how different types of land use and land cover affect stream health. Of the watershed area, 43% is forested, 33% is covered by impervious surfaces (including the Tilcon quarry site, since the runoff potential of bare stone is close to that of impervious surfaces), and 19% is grass (which includes open fields, lawns, and golf courses). The last 5% of the watershed is bodies of water and fallow areas. 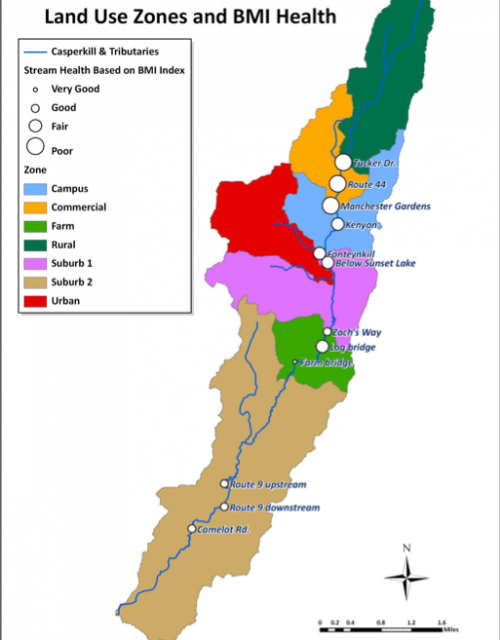 The Foteynkill subwatershed is the most urbanized part of the watershed, made up of 70% impervious surface. This portion of the watershed drains parts of the City of Poughkeepsie. 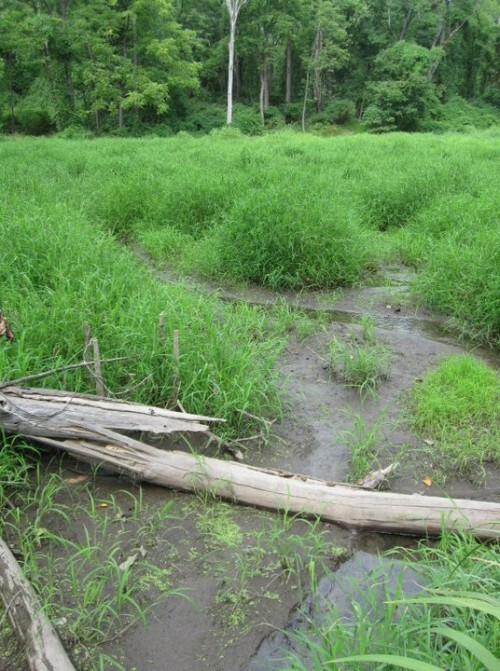 Many studies have demonstrated a connection between land cover and the health of aquatic ecosystems. 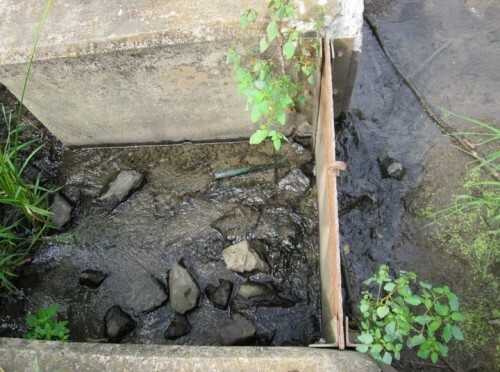 Different types of land covers can determine whether a watershed is deemed “healthy” or “unhealthy.” Studies of the benthic macroinvertebrates at 12 different sites along the Casperkill Creek showed the most impairment of the ecosystems in the commercial land use zones–by Tucker Drive, Route 44, and Manchester Gardens. 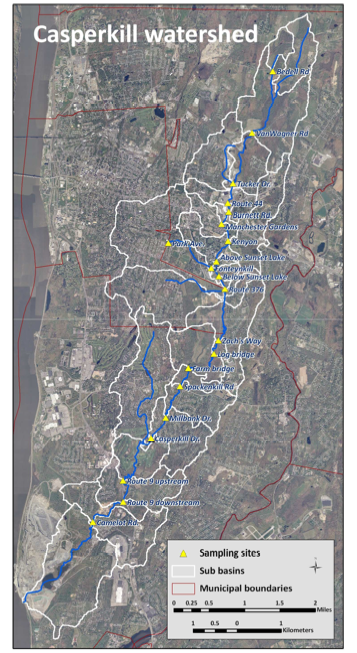 Water quality improved downstream as the Casperkill entered suburban, rural, and farm land use zones. Each site that was tested is depicted by a white circle; the bigger the circle, the poorer the health of the benthic macroinvertebrate community. Healthier sites have higher populations of BMI families that are more sensitive to pollution, including Caddisfly larvae, Hellgramites, Mayfly nymphs, Gilled snails, Riffle beetles, Stonefly nymphs, and Water pennys. 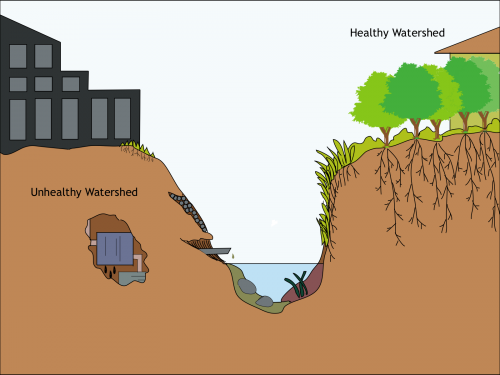 A healthy vs. an unhealthy watershed, image courtesy of http://www.dutchesswatersheds.org. This post was adapted from Health of the Casperkill, Dutchess County, New York. In February 2009, the Vassar College Environmental Research Institute, the Cornell Cooperative Extension Environment Program, and the Casperkill Watershed Alliance researched and compiled a thorough report on the health of the Casperkill Creek. Students and faculty working with ERI (Vassar’s Environmental Research Instutitue) spent two years studying the creek and the watershed. This post is the first in a series that will summarize the findings of that report. The research began in spring of 2006, after members of the ERI grew concerned about the health of the stream (especially for the aquatic communities in the stream) after they noticed several algal blooms on Sunset Lake and read about raw sewage spills in the Poughkeepsie Journal. Research continued for 22 months, as student and faculty worked to determine what the overall health of the stream is, identify the sources of pollution, and reach out to local residents and government officials to improve water quality. Research included water quality monitoring on a monthly basis, assessing parameters such as the amount of road salt in the stream; dissolved oxygen,nutrient, bacteria, and heavy metal levels; stream water pH; the extent and type of streamside vegetation; and the state of aquatic organisms. The majority of samples were taken between rainfall events, at times of low flow. Casperkill Assessment Project (CAP) members presented their findings at public forums in September of 2006 and 2007, during which streamside residents expressed concerns about pollution, flooding, and loss of biodiversity. These forums led to further presentations before the town board of the Town of Poughkeepsie and at local Hudson Valley watershed conferences. CAP members also distributed a survey to residents and business owners in the watershed to determine how residents viewed and used the stream and whether sufficient interest existed to create a watershed protection group. The goal of the CAP is to build a collaborative project involving residents of Poughkeepsie and students and faculty at Vassar College to help make the Casperkill the best and healthiest possible community resources. “The Health of the Casperkill, Dutchess County, New York.” Prepared by the Vassar College Environmental Institute, with Cornell Cooperative Extension Environment Program and the Casperkill Watershed Alliance. February 2009. Vassar Students and the Watershed, 1930-1943 and 1970. New archive footage unearthed for the sesquicentennial highlights Vassar students’ relationship with the Casperkill Watershed. For Vassar’s 150th anniversary, three videos shot between 1930 and 1943 have been uploaded onto the Vassar YouTube channel. In each video from each period, students can be seen enjoying the Watershed through Sunset Lake and Vassar Lake in many ways. The footage shows the importance the bodies of water have historically had in the lives of Vassar students and the Vassar experience. 0:28 – 0:35 — Students look out over Sunset Lake. 5:46 – 5:53 — A look over Vassar Lake. 7:16 – 7:18 — Students cross a bridge that goes over the Casperkill, near Skinner. 12:13 – 12:37 — Students play and relax around Sunset Lake. 21:44 – 23:47 – Graduation on Graduation Hill, overlooking Sunset Lake. While the previous two videos are compliations of various pieces of footage, this video is a cohesive film which sets out to explore the daily life of Vassar students. In this film, the Capserkill Watershed is used by students less for recreation than it is for academic pursuits, although there is, of course, a scene of students ice skating. 19:43 – 20:00 — Ice skating on Sunset Lake. This film, made by professor and founder of the film department, James Steerman, is composed of a series of vignettes about life at Vassar. Compared to the three earlier collages, this film has far fewer glimpses at any of the elements of the watershed on campus. This could have to do with the elevating levels of pollutions in the three preceding decades, drastically lowering students’ recreational use of the lakes. 27:07 – 27:22 — A man walks along the banks of Sunset Lake while a younger woman (probably a student) examines the waters. The famous Sunset Hill daffodils are also seen. *If you have a correction or can better identify which lake/creek this is, please email me at thdernbach@vassar.edu. Thanks! This is the first week of Dutchess Watershed Awareness Month! For the whole month of July, the Dutchess Watershed Coalition, is putting on events to raise awarness and appreciation of the watersheds of Dutchess County. 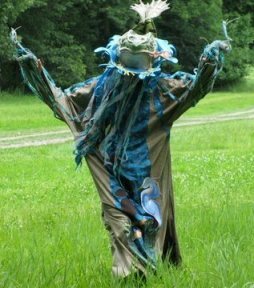 There are events for the Tenmile River, Wappinger Creek, Fishkill Creek, the Northern Dutchess, Croton, and Great Swamp, as well as our lovely Casperkill and Fall Kill — which will take place during the week of July 10-16. Below is a partial schedule of the events from that week. Visit http://www.dutchesswam.com/2011-events for a full schedule of all this month’s activities. The Casperkill Watershed Alliance will be having a stream table demonstration with healthy stream and watershed informational pamphlets. Members of the Ralph T. Waterman Bird Club will lead a walk on the Farm and provide information on resident birds of the area. Join volunteers from the Casperkill Watershed Alliance and Vassar College in cleaning up the Casperkill Creek from where it enters Vassar campus down to Sunset Lake. For more information contact Will Jobs at wijobs@vassar.edu. Help the Town of Poughkeepsie mark storm drains in the Arlington area. These markers act as reminders that our storm drains are connected to our creeks and the Hudson River. For more information contact Will Jobs at wijobs@vassar.edu. 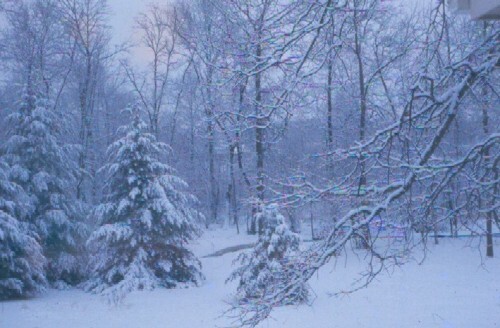 This winter has been one of the harshest in recent memory. The battle to keep sidewalks, driveways, and roads cleared and safe for traveling has been raging for a few months now. Spreading salt on roads and walkways to reduce ice is a common practice, as it is relatively cheap and saves lives and property. Road salt is effective because it lowers the freezing point of water, which causes the water to stay a liquid rather than freezing to ice. In fact, “salting the earth” refers to the ancient practice of spreading salt on enemies’ fields to make them incapable of growing crops. Salt use in the United States has risen from 0.16 million tons in 1940 to more than 23 million tons in 2005. In 2008, 71% of this was used for road de-icing, compared to only 5% for human consumption . This means that every year, we apply approximately 16 million tons of salt to roadways in the United States. Although we often don’t think about it, all of this salt has to go somewhere. Salt enters streams when water from rain or melting snow washes it into stormdrains that lead directly to waterways (i.e. lakes, streams, rivers, or wetlands). Salty stormwater can also flow into pervious surfaces like soil, where salts can accumulate or flush through to groundwater systems. Salt in groundwater migrates slowly toward streams throughout the year, so that even during warmer months there are elevated levels of salt in the water. For most of the year, chloride levels are below EPA water quality standards of 230 mg/L. However, during the winter months some streams exceed this. The Casperkill Creek is known to have among the highest chloride concentrations of all streams in Dutchess County. In winter, chloride concentrations in the Casperkill can exceed 1050 mg/L. 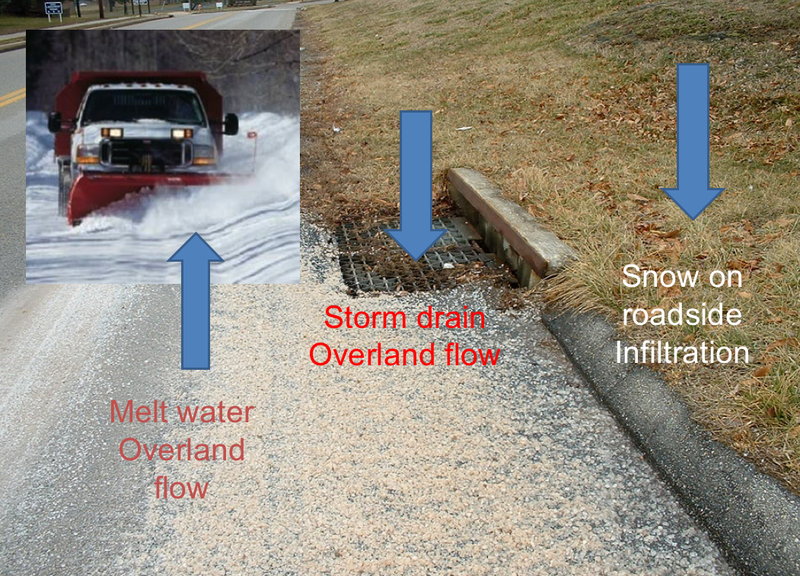 These elevated levels are due to relatively high percentages of impervious surface cover (roads, parking lots, etc) where road salt is applied within the Casperkill watershed. Reducing the amount of road salt applied during the winter would have many benefits: it would save money for municipalities, limit the wear on vehicles, and lessen the environmental impact. Unfortunately, road salt inputs are very difficult to reduce because it has proven to be an effective way to remove ice from paved surfaces and reduce the risk of accidents. We have come to expect clear and safe roads in all seasons, especially as commuting is important for many residents in the area and public transportation options are often limited. Some small steps you can take to reduce the amount of road salt applied in your neighborhood include: encouraging your local department of transportation to require training sessions and possibly retrofit trucks with applicator regulators. If you’re applying road salt to your driveway or walkway, be mindful of how much you use. Applying the salt as a briny liquid instead of a solid may also help improve its effectiveness. 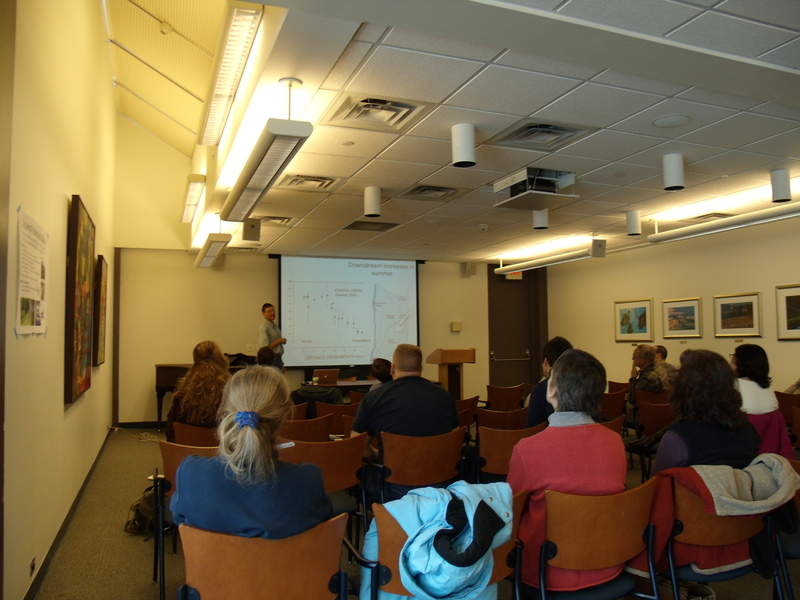 Photo from recent road salt conference at Vassar College, courtesy of Will Jobs. For more information check out this report from the Cary Institute of Ecosystem Studies, which details how we can move towards a solution that reduces the amount of road salt that makes it into our local streams every year. Photo of the Casperkill in winter from Anton Wellbrock, c. 1973. Join us this Sunday for a tour of the Casperkill watershed – the land area that drains into the Casperkill Creek. After meeting at Vassar College, we’ll drive to several sites along the creek. Student and faculty researchers from Vassar College will discuss the history of the watershed, results from water quality research, and ways to get involved in protecting the creek. Please RSVP if you would like to come along – contact Emily Vail at emvail@vassar.edu or (845) 677-8223 ext. 138 to reserve your space or for additional information. Transportation up to 20 people will be provided. Event will take place rain or shine. Please wear sturdy shoes and appropriate clothing in case of rain. Check out our article, which was published in the Poughkeepsie Journal on Sunday, September 5 in the Environment section. One reason for the disappearance of open space in this stretch of land was the expansion of IBM in Poughkeepsie in the mid 20th century. In the early 1900s the land that eventually became the golf course and country club was divided into three sections: the Dickerson Farm (see this earlier post on the Fort Homestead); Kingwood Park; and the Cedar Hill agricultural farm owned by Mr. and Mrs. Theodore H. Miller, who also managed the DeLaval Separator company in Poughkeepsie. When IBM began to expand in Poughkeepsie in the 1940s, the company acquired these properties “for extension of the country club and Post-war housing for IBM employees,”(1, 2) and hired the legendary golf course architect Robert Trent Jones, Sr. to design a golf course. The IBM country club and golf course quickly became a popular spot for IBM employees and local residents to spend their free time. Several local residents remember visiting the IBM golf course. Sue Lynch, who has lived in Red Oaks Mill for 55 years, remembers cross country skiing on the golf course as a young girl; and Vinnie Bihn, who lives just downstream of the golf course, remembers swimming in a pond that is formed on the golf course by a dam along the Casperkill. In addition to visiting the grounds, Vinnie Bihn and his brother Helmuth also remember the IBM country club, which was built in 1946. Jim Warner, who worked at IBM from 1951 to 1989, gave us a very different perspective on the Country Club. When asked if he remembered visiting the country club as an employee, Mr. Warner replied: “Oh, the Country Club? That’s what kept the union out. We wanted a union and they said, ‘OK, you want a union? Then we’re going to close the Country Club.’ So that kept the union out of IBM all those years. In fact, they still haven’t gotten in. It’s still not unionized.” Although Mr. Warner did not necessarily see it as a negative thing that IBM has never had a union, he definitely felt that the company had used the aesthetic and recreational resource to manipulate its employees. After IBM began to scale back their operations in Poughkeepsie the company sold the country club and golf course. Today, Bright Horizons owns the former country club, and uses it primarily for recreation camps. Although the Town of Poughkeepsie came close to purchasing the recreation center at Casperkill last year to renovate it and open a new library, the deal ultimately fell through. (3) The future of the country club remains uncertain. Photo credit: Ghee, Joyce C, and Joan Spence. Poughkeepsie, 1898-1998: A Century of Change. NY: Arcadia Publishing (Sc), 1999. 2) “IBM Buys 300-acre Dickerson Tract; Housing, Club Extension Projected.” Poughkeepsie New Yorker 2 June 1944.